EnSolve Biosystems said it earned a patent from the U.S Patent & Trade Office for its EnScrub technology. The technology addresses contaminants from the aqueous effluent of sulfur oxide (SOx) scrubber systems for ships and oil refineries. Jason Caplan, EnSolve's CEO said: "This patent includes claims for both Maritime and land-based applications. In fact, we have successfully employed the EnScrub technology for SOx scrubber systems on ships as well as scrubbers at a major oil refinery in China." When asked if EnSolve plans to commercialize the technology on its own or seek a strategic partner, Caplan replied, "At first, we planned to grow the technology organically but, given the market size, have since decided to seek a global partner to help accelerate the commercialization process. We are open to either exclusively licensing the EnScrub technology or seeking strategic partners. 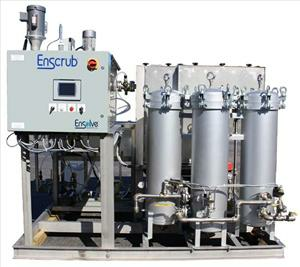 In the interim, we are selling EnScrub systems directly to scrubber companies and/or end users."